DeDop: a User Configurable Tool for Processing Delay Doppler Altimeter Data. The recent development of SAR altimetry, or more properly Delay Doppler altimetry, as first implemented on CryoSat-2 and now also operated on Sentinel-3, opens an exciting new era for the scientific community. This new approach offers to scientists an opportunity to develop new processing schemes and derive new and improved products, and so maximise the benefits of the measurements available from upcoming missions. Historically, in conventional altimetry, the understanding of the Level 1b processor was the responsibility of the instrument engineers with system expertise. This was logical as the subsequent levels of processing only needed the results produced by the Level 1b processor (Level 1b product) and the information contained in it. There were not many different correct ways of processing the raw data up to Level 1b. However, this approach is no longer appropriate for SAR Altimetry or Altimeter Delay Doppler Processing. The links between the Level 1B processing and the Level 2 processing, particularly the retracking of the waveforms, are very strong. For instance, different ways of performing the delay Doppler processing lead to different L1B waveform shapes,and peculiarities of the Delay Doppler Processor (DeDop processor) have a noticeable effect on the L1B waveform leading to changes in the geophysical retrievals. Due to this strong link between the Level 1b processing and the final geophysical retrievals, it is important that the SAR Altimetry scientific community gains a much better understanding the Level 1B processor, and is involved in new developments. For various reasons (e.g. the novelty of the processing, previous unavailability of adequate documentation, restricted availability of the low levels of data), this understanding is currently limited, both in general terms of what a DeDop processor is, and in the different options chosen for the different missions. The DeDop3 project provides the scientific community with the means to understand and use low level altimetry data and to become involved in how these data are processed. This is achieved by providing them with a Fully Adaptable and Configurable DeDop and a friendly user interface (a tool) to help them to interact with DeDop processor. The proposed DeDop has different options from which the user will be able to choose according to their particular field of interest. Examples of the new options are: surface focusing (particularly relevant for special targets like coasts, rivers or lakes), any kind of weighting along and across track, different azimuth processing approaches, stack masking, new stacking algorithms (e.g. ACDC), Sigma-0 at stack level, etc. DeDop is open source and available in such a way that users are able to explore the code, understand its possibilities, and to modify it to their own needs. The tool also comes with various demonstrations of new features that can be investigated and retrieved when using these lower data processing levels. They are presented as successful case studies. The DeDop tool comprises both a command-line interface, the DeDop Shell, and a graphical user interface, the DeDop Studio. The tool’s primary goal is to make it easy to configure and run and to provide a number of analysis functions to inspect and compare the L1B results. The tool’s target users are community scientists wishing to learn, modify or extend the DeDop processor configuration and/or code and then use the tool for comparisons between outputs of varying configurations generated by the DeDop. The image above shows two components: DeDop Studio and DeDop Core. DeDop Core consists of DeDop processor, DeDop Shell, and DeDop webapi. With DeDop Shell, users will be able to do all the operations using a command-line interface. Information on how to use DeDop Shell can be found in DeDop Shell. 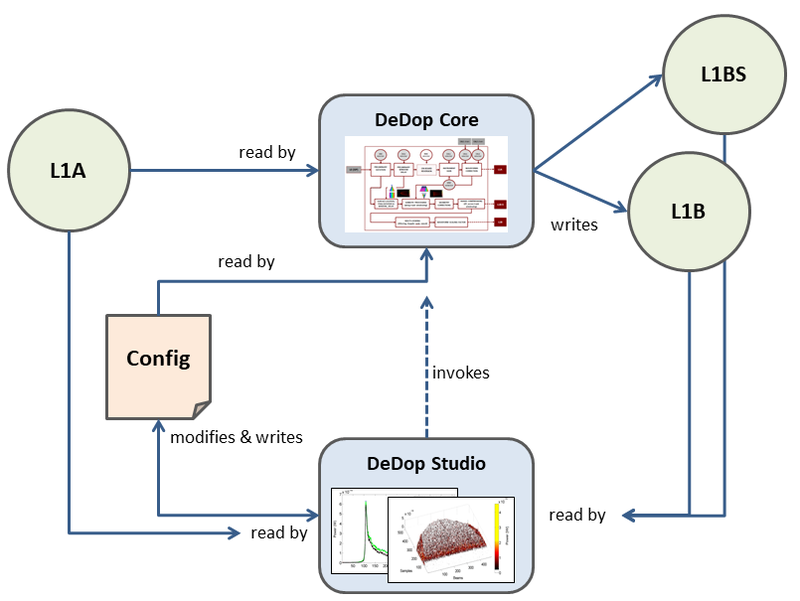 With DeDop Studio, users can also perform the same operations as in DeDop Shell (modifies & writes config, read L1A data, etc.) and in the end it invokes DeDop processor in DeDop Core via the webapi interface. More information about DeDop Studio can be found in DeDop Studio.